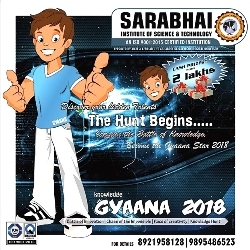 Sarabhai Institute of Science & Technology proudly announces its annual technical event,”GYAANA 2018″ – the hunt for the most talented students of Higher Secondary Schools of Kerala, scheduled to be conducted on the 24th of November 2018. Various programmes are organised to bring out the talents of the students, and they also get a chance to exhibit their innovative projects as well as present their project ideas. 9.30 am – 11.30 am : Inaugural session, followed by Expert talk on the topic “How toWin” by Sri. Brahmanayakam Mahadevan, Chairman, Athma Ability Foundation. 12.30 pm : Evaluation of Project Display. 2.00 pm – 3.30 pm : Valedictory Function & Prize Distributions. 1) Best Innovative Project Idea Contest: The students get a chance to showcase their innovative ideas for socially relevant projects in the areas of Science, Technology & Engineering by submitting an abstract of their idea in not more than 100 words, to the e-mail id gyaanasist@gmail.com.The selected students with the Best Idea will be intimated before 24th Nov 2018. Your ideas will be evaluated by eminent personalities in the field of Science, Technology & Engineering. 2) Project Display: The students can exhibit their projects which is innovative and socially relevant. The team may consist of 2-5 members. The exhibit can be brought to the venue on or before 23 Nov 2018. Your projects will be evaluated by a panel of eminent engineers. Students should participate as a team after registering online. A team shall consist of two members only. iii. 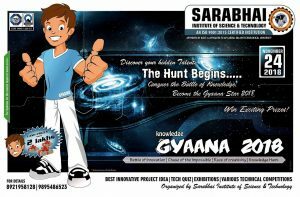 Questions will be based on General Science Awareness, Recent trends in Technology, Scientific Inventions and Discoveries. It is mandatory for all students to bring their regular valid identity card. The use of mobile phones and other electronic gadgets is not allowed during the Quiz. NB: Registration is for free for all participants. Copyright © 2019 Sarabhai Institute of Science and Technology. All Rights Reserved.